SEATTLE--(BUSINESS WIRE)--Oct. 3, 2018-- (NASDAQ: AMZN)—Today, Amazon announced the Fire TV Stick 4K, the most powerful streaming media stick available, plus an all-new Alexa Voice Remote, available together for $49.99. The all-new Alexa Voice Remote is also available with the recently launched Fire TV Cube for $119.99 and can be purchased as a single remote for $29.99. Over 80 percent more powerful than the best-selling Fire TV Stick, Fire TV Stick 4K features a new quad core, 1.7GHz processor, delivering a fast streaming experience, quicker load times, and brilliant picture quality. Plus, Fire TV Stick 4K gives you access to the vast catalog of content currently available on Fire TV including thousands of 4K Ultra HD, Dolby Vision, and HDR10+ titles. Fire TV Stick 4K is the first streaming media stick available with Dolby Vision and Dolby Atmos. Finding 4K content has never been easier on Fire TV—just say “Alexa, find 4K TV shows” or “Alexa, watch Tom Clancy’s Jack Ryan.” With a growing catalog of Dolby Atmos content, customers can also enjoy immersive sound when connected to compatible home audio systems. Fire TV Stick 4K also gives you access to tens of thousands of channels, apps, and Alexa skills, as well as over 500,000 movies and TV episodes on Fire TV. Enjoy favorites from Netflix, Prime Video, Hulu, STARZ, SHOWTIME, CBS All Access, and others. With Firefox or Amazon Silk browsers, visit millions of websites like YouTube, Facebook, and Reddit. Listen to songs, playlists, live radio stations, and podcasts through services like Amazon Music, Spotify, and iHeartRadio. Fire TV Stick 4K gives you access to live TV whether it’s through streaming apps like Hulu and PlayStation Vue or through Prime Video Channels. You can also pair Fire TV Stick 4K with Fire TV Recast and an HDTV antenna to easily watch, record, and replay free over-the-air TV programming. Many of your favorite apps like Netflix, Prime Video, Hulu, SHOWTIME, and ESPN already have enhanced in-app voice controls on Fire TV. Today, we are announcing increased in-app voice control on new apps like A&E, AMC, Sony Crackle, Hallmark Movies Now, HBO Now, HISTORY, IFC, Lifetime, and VH1. Now, you’ll be able to use Alexa to play, rewind, fast forward, and navigate through content—all with your voice. Combining Bluetooth, multidirectional infrared technology, and powered by our cloud-based service, the all-new Alexa Voice Remote allows you to power on your compatible TV and AV equipment, switch inputs, or tune to a channel on your cable box—all with a single remote. Plus, the all-new Alexa Voice Remote gives you even more control with dedicated power, volume, and mute buttons, along with the ability to use voice commands to find and control content. The all-new Alexa Voice Remote is compatible with tens of millions of Fire TV devices, including the latest generations of Fire TV streaming media players, and can control power and volume on tens of thousands of TVs, sound bars, and AV equipment. For more information on device compatibility, visit amazon.com/alexavoiceremote. Fire TV Stick 4K (amazon.com/firetvstick4k) is available for pre-order now on Amazon for $49.99 and will start shipping on October 31 in the United States and Canada. It will ship in the United Kingdom, Germany, and India on November 14. Fire TV Stick 4K is also available for pre-order in Japan and will ship before the end of this year. The all-new Alexa Voice Remote (amazon.com/alexavoiceremote) is available for pre-order as a standalone remote for $29.99 and will start shipping on October 31 in the United States and Canada. It will ship in the United Kingdom, Germany, and India on November 14. It is also available for pre-order in Japan and will ship before the end of this year. Amazon Fire TV Cube (amazon.com/firetvcube) with the all-new Alexa Voice Remote is available for pre-order on Amazon in the United States for $119.99 and will start shipping on October 31. Customers can pre-order the Fire TV Stick 4K and the all-new Echo Dot together for $79.98—a 20 percent savings. Customers can pre-order two Fire TV Stick 4K devices for $89.98—a 10 percent savings. Customers can also get Fire TV Recast, a 35-mile HDTV antenna, and Fire TV Stick 4K together for $249.99—a savings of over $50. For more information, visit amazon.com/firetvstick4k. Eligible customers who purchase a Fire TV streaming media player in the United States, United Kingdom, Germany, and Japan will receive 3 months free of Amazon Music Unlimited, Amazon’s premium music streaming tier with access to tens of millions of songs and thousands of playlists and personalized stations, combined with the magic of voice controls powered by Alexa. Fire TV Stick: The latest generation of our best-selling Fire TV Stick—for $39.99. 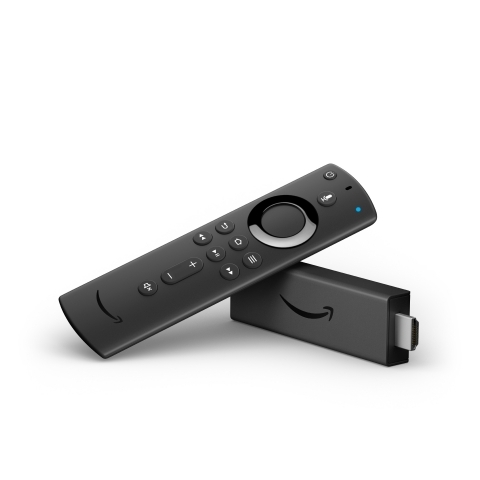 Fire TV Stick 4K: The most powerful streaming media stick available, the first to support Dolby Vision and Dolby Atmos, and the first Fire TV device to support HDR10+. Fire TV Stick 4K features a new quad core, 1.7GHz processor, delivering a fast and fluid navigation and streaming experience—for $49.99. Fire TV Cube: Fire TV Cube is the first hands-free streaming media player with Alexa, delivering an all-in-one entertainment experience. With far-field voice recognition, eight microphones, and beamforming technology, Fire TV Cube hears you from any direction. Enjoy hands-free voice control of content—search, play, pause, fast forward, and more—for $119.99. Fire TV Recast: A companion DVR that lets you watch, record, and replay free over-the-air live TV on Fire TV, Echo Show, and on compatible Fire tablets, iOS, and Android devices—starting at $229.99. Toshiba 4K UHD Smart TV– Fire TV Edition delivers true-to-life 4K Ultra HD picture quality with over 8 million pixels for stunning clarity, deep contrast, and vivid colors. It is available in three sizes: 43”, 50”, and 55”. Toshiba HD Smart TV– Fire TV Edition available in three sizes: 32”, 43”, and 49”. The 32” delivers 720p picture quality and the 43” and 49” both deliver 1080p picture quality for lifelike detail, rich contrast, and brilliant colors. Insignia 4K UHD Smart TV – Fire TV Edition has 4K Ultra HD resolution, which delivers brilliant picture quality that is up to four times sharper than HDTV. It is available in three sizes: 43”, 50”, and 55”. Insignia HD Smart TV– Fire TV Edition available in three sizes: 24”, 32”, and 43”. The 24” and 32” both deliver 720p picture quality and the 43” delivers 1080p picture quality for lifelike detail, rich contrast, and brilliant colors.